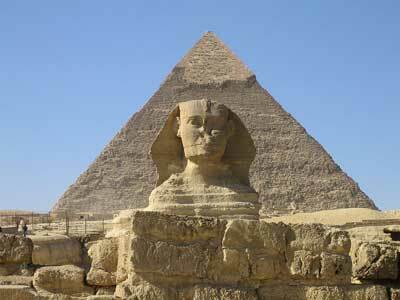 Here is a glance at some of the sightseeing places in Egypt. Were reckoned by the Greeks to be one of the Seven Wonders of the World. 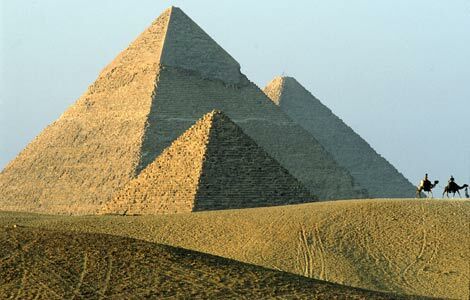 A single pyramid is built of 2,300,000 blocks, each weighing an average of two-and-one-half tons. In the face of such immensity, one cannot help but feel the wonder and awe that so many writers and artists have sought to convey over the centuries. The Cheops Pyramid is especially interesting since its interior burial chambers are open to public. Not far from the Pyramids, is the Great Sphinx of Giza, which dates from the time of Chephren (2620 BCE). Hewn from natural yellowish limestone and standing 65 feet high and 187 feet long, this unforgettable statue combines the head of a Pharaoh with a lion's body. 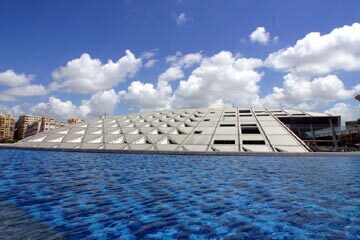 The Egyptian Museum is the major depository of Egyptian antiquities in the world. It features artifacts from the Pharaonic and Greco-Roman periods, including the celebrated mummies of ancient Egypt's King and Tut Ankh Amun treasures. Memphis served as the capital of Upper and Lower Egypt some 5,000 years ago during the First Dynasty. Menes, the first pharaoh of this dynasty, built a great white-walled palace and the Temple of Ptah here. Sakkara is one of the most exciting historical and archaeological areas in Egypt , situated about 12 miles South-West of Cairo. The site is dominated by the famous step pyramid of King Zoser. It was the first pyramid to be built in Ancient Egypt, preceding those at Giza by many centuries, and is the work of the famous Pharaonic architect Imhotep. Situated on a spur of the Muqattam Hills, the citadel dominates Cairo's skyline and was the nerve center of the city and Egypt for almost 700 years. Its construction was initiated in 1176 by Saladin and completed by Muhammad Ali. Mameluke Sultans and Turkish governors later on made it their residence, building palaces and mosques within the citadel walls. Facing the citadel is the Mosque of Sultan Hassan, built between 1356 and 1363 and perhaps the most majestic monument of Arab architecture in Egypt. The tour also includes a visit to Khan El-Khalili, a famous Cairo bazaar dating back to the late fourteenth century. 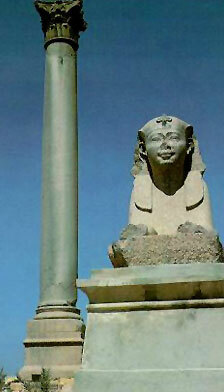 An approximately 25 m red Aswan granite column with a circumference of 9 m, was constructed in honor of the Emperor Diocletain. Originally from the temple of the Serapis, it was once a magnificent structure rivaling the Soma and the Caesareum. Nearby are subterranean galleries where sacred Apis bulls were buried, and three sphinxes. After his defeat by Julius Caesar in the civil war, Pompey fled to Egypt where he was murdered in 48 BC; mediaeval travelers later believed he must be buried here, and that the capital atop the corner served as a container for his head. In fact, the pillar was raised in honor of Diocletian at the very end of the fourth century. Diocletian captured Alexandria after it had been under siege. The Arabs called it "Amoud El-Sawari", Column of the Horsemen. The Pillar is the tallest ancient monument in Alexandria. These tombs were tunneled into the bedrock during the era of the Antonine emperors (2nd century CE) for a single wealthy family still practicing the ancient religion. As a privately-financed project, it is an engineering feat of some magnitude. These tombs represent the last existing major construction for the sake of the old Egyptian religion. They are alone worth the trip to Alexandria. Though the funerary motifs are pure ancient Egyptian, the architects and artists were schooled in the Greco-Roman style. Applied to the themes of Ancient Egyptian religion, it has resulted in an amazing integrated art, quite unlike anything else in the world. A winding staircase descends several levels deep into the ground, with little chapels opening from it, furnished with benches to accommodate visitors or mourners bringing offerings. 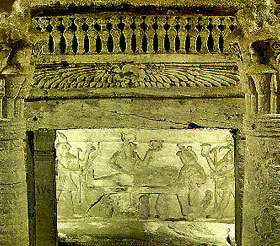 There are niches cutout to hold sarcophagi. At the meeting point of the three continents, Asia, Africa and Europe, Egypt has been the cradle of civilizations since ancient times. The ancient city of Alexandria was at the beginning of the third century BCE the birthplace of the great plan to build a library: the Bibliotheca Alexandrina. However, a fire, which ravaged Alexandria, destroyed the Library, this vast storehouse of learning. The Egyptian Government, in co-operation with UNESCO, decided to resurrect the old dream to endow this part of the world with an important focal point for culture, education and science.